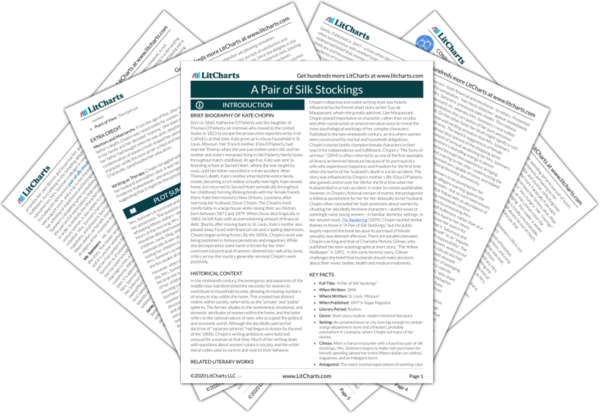 Instant downloads of all 942 LitChart PDFs (including A Pair of Silk Stockings). 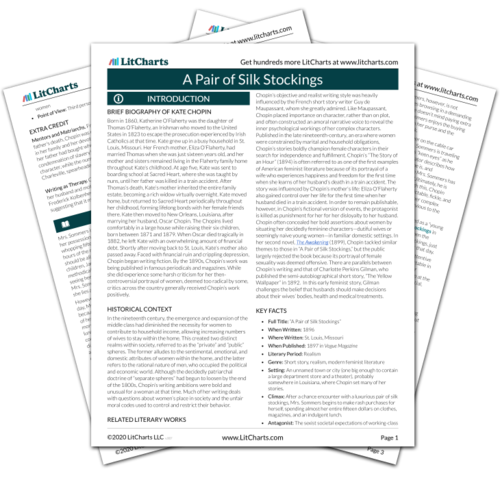 Welcome to the LitCharts study guide on Kate Chopin's A Pair of Silk Stockings. Created by the original team behind SparkNotes, LitCharts are the world's best literature guides. A concise biography of Kate Chopin plus historical and literary context for A Pair of Silk Stockings. A quick-reference summary: A Pair of Silk Stockings on a single page. In-depth summary and analysis of every of A Pair of Silk Stockings. Visual theme-tracking, too. Explanations, analysis, and visualizations of A Pair of Silk Stockings's themes. A Pair of Silk Stockings's important quotes, sortable by theme, character, or . Description, analysis, and timelines for A Pair of Silk Stockings's characters. Explanations of A Pair of Silk Stockings's symbols, and tracking of where they appear. An interactive data visualization of A Pair of Silk Stockings's plot and themes. Born in 1860, Katherine O’Flaherty was the daughter of Thomas O’Flaherty, an Irishman who moved to the United States in 1823 to escape the prosecution experienced by Irish Catholics at that time. Kate grew up in a busy household in St. Louis, Missouri. Her French mother, Eliza O’Flaherty, had married Thomas when she was just sixteen years old, and her mother and sisters remained living in the Flaherty family home throughout Kate’s childhood. At age five, Kate was sent to boarding school at Sacred Heart, where she was taught by nuns, until her father was killed in a train accident. After Thomas’s death, Kate’s mother inherited the entire family estate, becoming a rich widow virtually overnight. Kate moved home, but returned to Sacred Heart periodically throughout her childhood, forming lifelong bonds with her female friends there. Kate then moved to New Orleans, Louisiana, after marrying her husband, Oscar Chopin. The Chopins lived comfortably in a large house while raising their six children, born between 1871 and 1879. When Oscar died tragically in 1882, he left Kate with an overwhelming amount of financial debt. Shortly after moving back to St. Louis, Kate’s mother also passed away. Faced with financial ruin and crippling depression, Chopin began writing fiction. By the 1890s, Chopin’s work was being published in famous periodicals and magazines. While she did experience some harsh criticism for her then-controversial portrayal of women, deemed too radical by some, critics across the country generally received Chopin’s work positively. 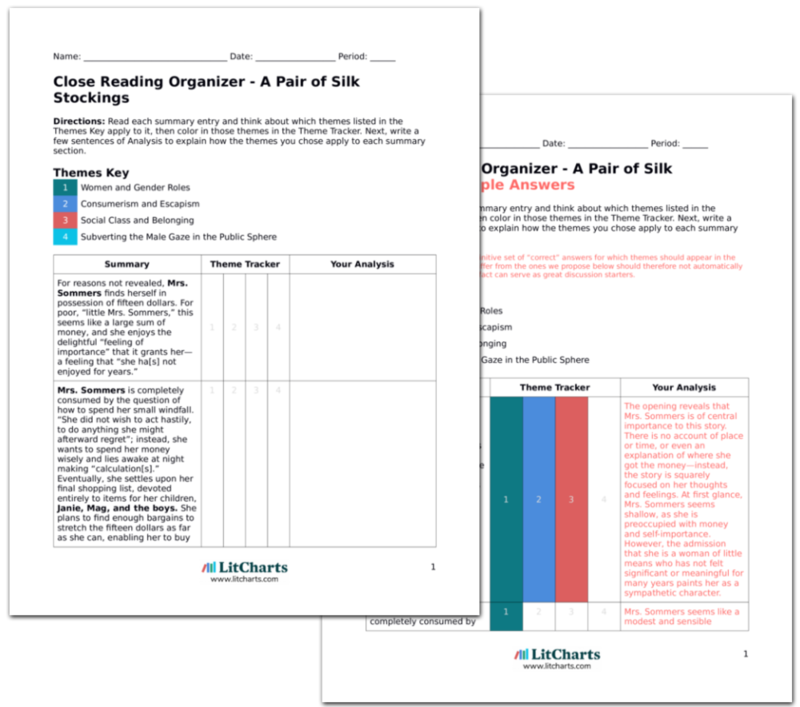 Get the entire A Pair of Silk Stockings LitChart as a printable PDF. In the nineteenth century, the emergence and expansion of the middle class had diminished the necessity for women to contribute to household income, allowing increasing numbers of wives to stay within the home. This created two distinct realms within society, referred to as the “private” and “public” spheres. The former alludes to the sentimental, emotional, and domestic attributes of women within the home, and the latter refers to the rational nature of men, who occupied the political and economic world. Although the decidedly patriarchal doctrine of “separate spheres” had begun to loosen by the end of the 1800s, Chopin’s writing ambitions were bold and unusual for a woman at that time. Much of her writing deals with questions about women’s place in society and the unfair moral codes used to control and restrict their behavior. Chopin’s objective and realist writing style was heavily influenced by the French short story writer Guy de Maupassant, whom she greatly admired. Like Maupassant, Chopin placed importance on character, rather than on plot, and often constructed an amoral narrative voice to reveal the inner psychological workings of her complex characters. Published in the late nineteenth-century, an era where women were constrained by marital and household obligations, Chopin’s stories boldly champion female characters in their search for independence and fulfillment. Chopin’s “The Story of an Hour” (1894) is often referred to as one of the first examples of American feminist literature because of its portrayal of a wife who experiences happiness and freedom for the first time when she learns of her husband’s death in a train accident. The story was influenced by Chopin’s mother’s life: Eliza O’Flaherty also gained control over her life for the first time when her husband died in a train accident. In order to remain publishable, however, in Chopin’s fictional version of events, the protagonist is killed as punishment for her for her disloyalty to her husband. Chopin often concealed her bold assertions about women by situating her decidedly feminine characters—dutiful wives or seemingly naive young women—in familiar domestic settings. In her second novel, The Awakening (1899), Chopin tackled similar themes to those in “A Pair of Silk Stockings,” but the public largely rejected the book because its portrayal of female sexuality was deemed offensive. There are parallels between Chopin’s writing and that of Charlotte Perkins Gilman, who published the semi-autobiographical short story, “The Yellow Wallpaper” in 1892. In this early feminist story, Gilman challenges the belief that husbands should make decisions about their wives’ bodies, health and medical treatments. Setting: An unnamed town or city (one big enough to contain a large department store and a theater), probably somewhere in Louisiana, where Chopin set many of her stories. Climax: After a chance encounter with a luxurious pair of silk stockings, Mrs. Sommers begins to make rash purchases for herself, spending almost her entire fifteen dollars on clothes, magazines, and an indulgent lunch. Mentors and Matriarchs. From the age of five, after her father’s death, Chopin was raised solely by women. The women in her family and her devoted “mammy” (the slave nurse whom her father had bought when he was alive, despite growing condemnation of slavery) both shaped her personality and character, while the nuns at her school and her tutor, Madame Charleville, spearheaded her education. Writing as Therapy. Chopin struggled with depression after her husband and mother died. It was her obstetrician, Dr. Frederick Kolbenheyer, who encouraged her to start writing, suggesting that it might be therapeutic for her. Farnham, Harriet. "A Pair of Silk Stockings." LitCharts. LitCharts LLC, 30 Jan 2019. Web. 21 Apr 2019. Farnham, Harriet. "A Pair of Silk Stockings." LitCharts LLC, January 30, 2019. Retrieved April 21, 2019. https://www.litcharts.com/lit/a-pair-of-silk-stockings.